Heat oil in pan to medium high heat, add dried shrimps, garlic, mushroom and Chinese sausage, saute for 2 - 3 minutes until fragrant. Add cooked glutinous rice, stir and break rice clumps as much as possible. Add 1 – 2 tablespoon of water if needed, it helps to break the clumps. Add dark soy sauce, sugar, salt and white pepper. Stir and mix, until all the rice colored. Add wine, stir and mix. Finally, add baked peanut, mix well. Stir-fried sticky rice (glutinous rice) is a Chinese dish. It is always cooked with Chinese sausage, mushroom and roasted peanut. But, the dish can be modified according to the ingredients that are available. 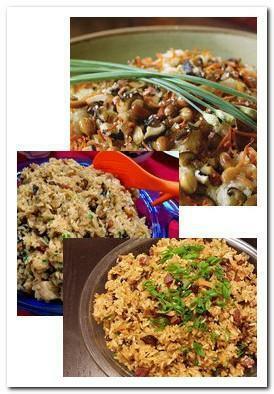 Use the ingredients that on hand or easy to get, home cook stir-fried sticky rice also can be savory and delicious. The rice is flavorful, soft and soggy. The cooking process is similar to Italian risotto. But people do develop “modern” way of cooking this and save some effort.